Manchester City regained their spot atop the Premier League table by inflicting Chelsea’s heaviest ever defeat in the competition. Guardiola was understandably beaming after the final whistle and approached Sarri to conduct the unofficial obligation of a post-match handshake. Setting his stool out early, the Spanish coach walked towards his saddened counterpart with a visible hand, but Sarri had already made up his mind. 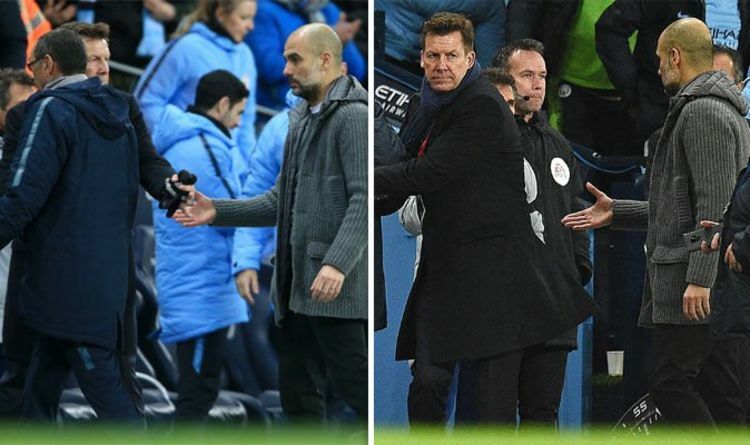 Making a beeline for the tunnel, the 60-year-old did not flinch at the Guardiola, who was a matter of feet away before giving up on the locking of hands. Instead, the former Barcelona manager found Chelsea assistant coach Gianfranco Zola and shared words with the former striker. In stark contrast to Guardiola’s buoyancy, Sarri cut a melancholy figure and said: “You’ll have to ask the club,” when posed with his unclear Chelsea future. Ten days ago, Sarri gave his players a dressing down at Bournemouth after losing 4-0 on the south coast, banishing his coaching staff out of the dressing room. The preceding week the Italian chose to speak in his mother tongue in the post-match press conference following Chelsea’s 2-0 loss at London rivals Arsenal. Sarri’s tight rope is fraying game-by-game and the football philosopher admitted he did not have all the answers to the team’s problems in a post-match interview at the Etihad Stadium. “At the moment I am not able to explain,” he conceded. “During the week my feeling was good during training. Maybe the goal we concede after three minutes it was difficult to play. “It was difficult not to give them spaces. We were in trouble. I am not able to understand. We made a lot of mistakes against the wrong opponents. “They played fantastic football and we made a lot of mistakes. We wanted to press them at the beginning of the action but the plan was completely ruined because we concede after three minutes. “I think the big difference between the two teams was the intensity of pressing. They pressed really well and we were not able to do it. “We were not able to react in the right way. We were not able to stay in the match. “At the moment we have a big problem away. The beginning of the season we were better away than at home. “But everything has changed in the last month. We need to understand. A Princess Vanishes. A Video Offers Alarming Clues. This Rotten Week: Predicting Alita: Battle Angel, Happy Death Day 2U and Isn't it Romantic Reviews!